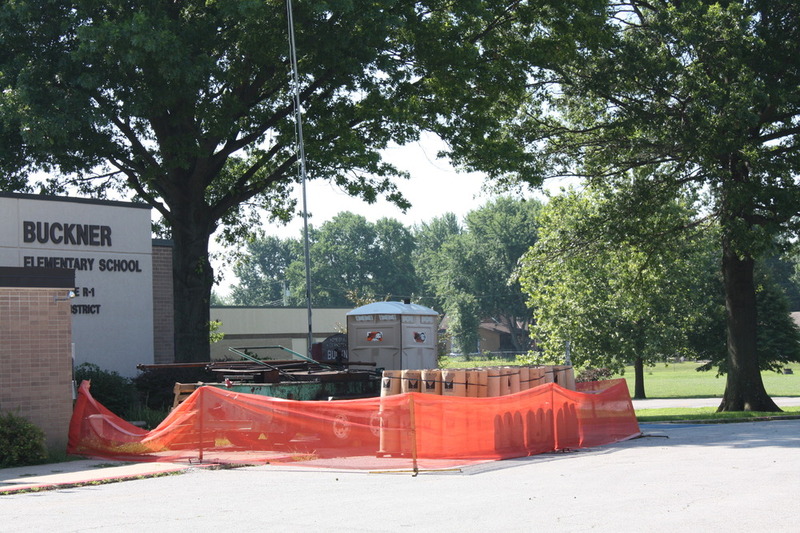 Students at Buckner Elementary School should have a non-leaking roof over their heads when they return to school August 17, according to Fort Osage Superintendent Mark Enderle. Prior to re-roofing, the Buckner Elementary School ceiling was leaking in 200 places, which interfered with classes and distracted students, according to a local news report on KSHB-TV. The report aired last spring in the lead up to an election in which voters authorized $7.8 million in school bonds for the district. About $495,000 of that amount was to pay for re-roofing Buckner Elementary School. However, after the bonds were sold and the district was able to bid out the job, the winning bid came in $88,000 under the estimated budget. On the district’s Facebook page, several community members asked why the school didn’t have insurance to pay for the new roof. The district did not reply in that forum. However, on the district’s own website, the superintendent explained that before the decline in Missouri funding for education, state gaming money would have been used to pay for such repair and maintenance. However, all funding now supports student education and staff salaries. In addition to the new roof at Buckner Elementary, the district needed to replace lighting at the high school football stadium, where lights were becoming detached from the old stands. That job started on time in late June (a couple of weeks before re-roofing at the elementary school), leading to more frustrated Facebook comments from community members under the impression that the district might be prioritizing athletics ahead of academics. Replacing the stadium lighting, which cost about $400,000, was nearing completion in early July, according to the superintendent’s report to the board of education. Dr. Enderle also reported that the remaining work to be paid for with the new bond proceeds should begin next summer and that most of it should be complete by the start of the 2012-2013 school year. That work includes new roofs at the district’s Career & Technology Center and at Osage Trail Middle School. Work also includes new heating, ventilation and air conditioning systems throughout the district as well as new classrooms at Fort Osage High School. During the $7.8-million bond campaign last spring, the district projected construction costs for these projects would total about $6.2 million. The remaining funds — about 20 percent of the total — will pay for general expenses, bond expenses and a contingency fund.